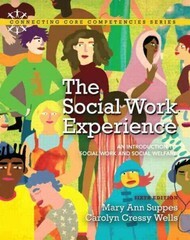 The Social Work Experience 6 Edition Learn how social workers use their professional expertise to assist people. This text is part of the Connecting Core Competencies Series. The Social Work Experience: An Introduction to Social Work and Social Welfare introduces students to the profession of social work including eight major fields of practice, and provides in-depth discussion of social welfare policy, its history, contemporary issues, and probable future trends. The book helps students understand how social workers use their professional expertise to assist people in solving a wide variety of problems to improve their lives. There are three major parts: The first part, Social Work and its Context, comprises four chapters which introduce the profession of social work, provide theoretical perspectives underlying generalist practice, investigate the concept of social justice, and explore social welfare policy and its history. The second part, Professional Practice Settings, offers an in-depth discussion of eight fields of practice: family and children’s services, mental health, health care, schools, older adult services, criminal justice, and developmental disabilities. The third and final part, A Look to the Future, views the profession through the eyes of futurists and explores the challenges and opportunities that await new social workers. A better teaching and learning experience This program will provide a better teaching and learning experience—for you and your students. Here’s how: Improve Critical Thinking — Discussions on values, ethics, human diversity, and generalist social work practice throughout stimulate students to think critically about varying issues. Engage Students — Case studies introduce each chapter and are carefully developed to illustrate the myriad of problems that social workers deal with in daily practice. Explore Current Issues — Includes new content on a variety of issues, including policy diversity, the environment, and much more. Apply CSWE Core Competencies — The text integrates the 2008 CSWE EPAS, with critical thinking questions and practice tests to assess student understanding and development of competency. Support Instructors — An Instructor’s Manual and Test Bank, Computerized Test Bank (MyTest), BlackBoard Test Item File, and PowerPoint presentations are included in the outstanding supplements package.